So, this review comes about due to the stereotypical father taking care of a Christmas gift. My son got to try out a fitness band at school and he likes coming to the gym with me, so getting him a fitness tracker would be an awesome idea. I did some skulking around on the interwebs and I had heard about the Mi Band being fairly inexpensive ... so why not. Found one online for under $50 (the equivalent would be the Fitbit Alta HR and that runs at $150 on special) and ordered. I probably should have ordered it sooner ... because even though it should have been here for Christmas with over a week to spare, it only got here just before New Years. As I panicked I ended up getting my son the Fitbit Alta HR so he could have something to open. 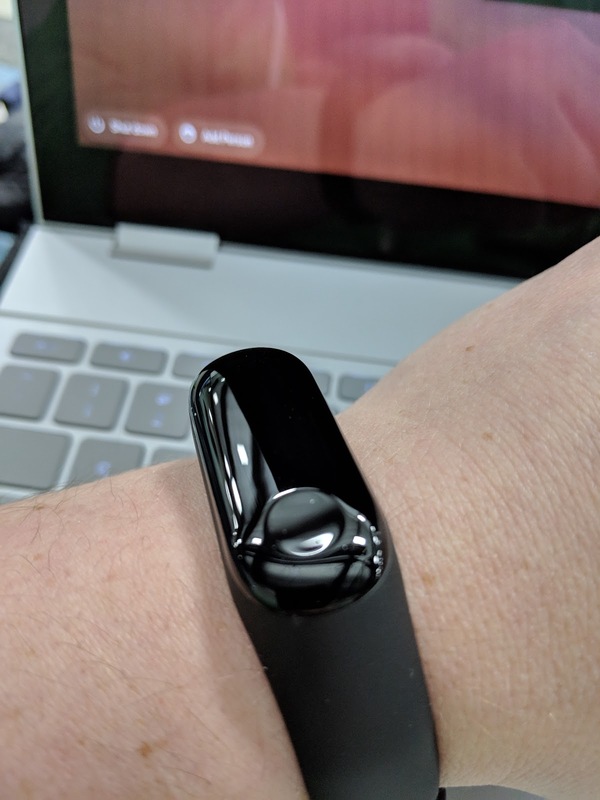 By the time the Mi Band 3 arrived he wasn't about to give up his Fitbit, so what to do with the Mi Band? I have been thinking the Moto 360 Sport could use retiring, so why not give it a shot while I had a few more days off. The short of the review here is that I was actually quite surprised how much I liked it. 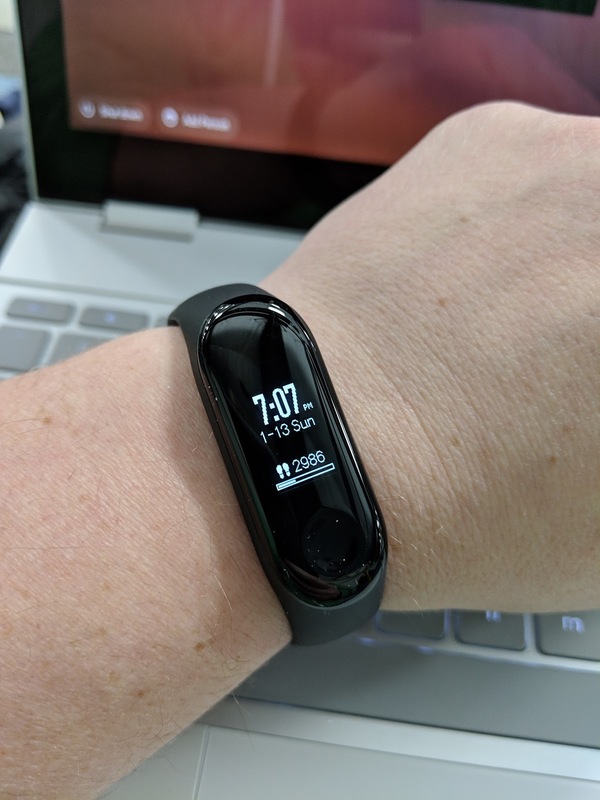 It's incredibly simplistic compared to the WearOS type stuff - but really it's the right amount for a fitness band. I was planning on using it only for a week or 2 and then go back to the Moto... but I'm finding myself delaying that decision thus far. For the $50CDN you'll get a simplistic looking band that is under 1" display and it has a very pixel/dot display that makes it look archaic. I say that, but we can still at least get a fuller display than my son's Fitbit. My favourite bit about it is that it actually has a 'button'. Well, not a real button, but an indent on the display that serves as one. Tap it and it acts like a 'back'. The display itself lets you touch and swipe it around for navigation. The display is very smooth and that being said it's very electrostatic and it finds just about any bit of fluff or lint. I even hear the little crackle sometimes as I swipe my finger over it. The navigation works like almost the original Wear did... you go through main features up/down and then on each feature you can go left/right to go through the options. This navigation layout is adjustable via the app (get to that in a bit). It's nice to be able to navigate via swiping and tapping the 'button' versus having to really 'bump' it and you can't really interact with it at all. This is about the right average in between a simple Fitbit and WearOS. Now to put it on it has a nice band with these notch/clasps and it holds really well. The band itself holds the actual device and holds it real tight. You have to get it out to charge. It pops out not so hard, but you have to wonder how long that band will last doing that again and again. Luckily, the battery lasts a long time, so we won't be doing it a lot. How long does the battery last? I had it set to check my heart rate every 10 minutes and after about 7 (or was it 8?) days it said it still had 50% to go. Apparently, if you put it in a battery efficient mode it can last over 20 days. Awesome. That's even when I leave it on at night and it monitors my sleep. It monitors my steps and running automatically. But if you want to manually start an activity you can navigate there and then you'd start by using a long press. It's fairly simple to do really. Now, all of this wouldn't be as cool if there wasn't some app background to make sense of it all. I'll admit, that I had some issues setting up ... it took me a while and a few password resets to make sure it worked, but in the end it did. One of the reasons that I chose Mi Band was that the Mi Fit app will connect with Google Fit, so .. score. I was worried that switching would cause me to not meet my Google Fit goals I had set up. So, let's go through the app. Immediately on the 'home' or Status page you see your circle representation of your daily steps, you can see last night's sleep information, latest workouts (now these are specific workouts that you manually tracked via the band or the app, not automatically picked up ones), your heart rate tracking for the day, your most recent weight recording and then a quick graph of when you'd met your goals. Tapping on the circle you get more detail, like actual burned calories and distance and then a list of the activities it's automatically sensed. Sleep is interesting. I'd always wanted to try it out, but my Wear OS devices never would last long enough to wear overnight and were way too big to be comfortable. I know I have bad sleeping habits so it's interesting to look and actually see how little sleep I get, but then how much of it is deep and light sleep. Then you get the 'sleep analysis' ... essentially all the stuff my mom would tell me. Watch how much coffee you drink as it's affecting your deep sleep. I'm not sure I understand the 'sleep regularity'. There's even a share button if you want to brag to friends about sleeping in on the weekends. On the bottom of the app you'll see you're on the 'status' page, if you click on 'workout' it's where you can manually set up a workout. Here's where you'll get options like 'outdoor running' or biking etc... because with the app you get the GPS of the phone. With the band you're limited to just treadmill running and 'exercise', ie. stuff that doesn't require any GPS data. On the profile app is where you can get more information about your account. It's here that you can add in other accounts like Google Fit. What my wife really likes about Fitbit is the ecosystem of friends that you can have, well here you can add other friends (let me know if you'd like to be my Mi Fit friend). 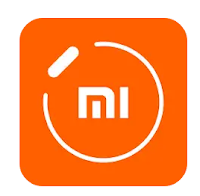 One feature to look through is to find the settings and turn off the "Show Status in Notification Shade" that way you don't get a persistent notification of "your mi band is connected". I find that annoying. Like here you'll see your the band you're using and tap it to get more information. The Unlock Screen is the ability that Android has to use 'trusted devices' where when the phone is connected to the band it can bypass the lock screen security. Cool features to set here are things like the Alarm. Because you're sleeping with it on, I find waking up to a buzzing thing on my wrist a lot easier to take than some blaring noise. I also like the "Idle Alert" where if I've been sitting at my desk too long I get a "it's time to move" buzz on the band. You can also have the phone find the band. That's handy. You can play with the heart rate detection to the level you want it to for your battery preference. I've chosen every 10 minutes (you can select from 1 min to 30 min intervals. The 2 biggest features you'll fiddle with here are the App Alerts and the Display Settings. App Alerts is a little odd. Whereas with Wear OS, EVERY notification from your phone is mirrored onto the watch, here, nothing is ... until you turn it on. Makes sense as not every notification is really meant to be displayed on a little screen, so they give you the option to turn it on (vs. with WearOS with turning it off). You'll want to play around here and really determine what you want to have show up on your band. It's not a Wear device ... somethings you may not want. I won't hide it tho'... notification are extremely... weird. I'll get one notification for a new text message. Then when I get a new text, because there's still another unread I'll get 2 ... so really I now have 3 notifications. It's odd. And your band is limited to just 5. The other bit is the Display Settings ... this controls the items/features that you scroll through on the band. Don't want the weather, you can turn it off. Want to rearrange which order they show in, you can move them around. What you CAN'T do is customize those items. Like you can't change the face (you can back in the 'more' feature on the band itself). I was hoping you could customize the workout items, but no. Like I said earlier, it kinda makes sense to only have non-GPS type activities ... but it just bugs me to have 'treadmill' as I always tell people how much I hate treadmills because they bore the crap out of me. There are a bunch of other settings and features to play with, but I won't go through each of them. Those are the main ones I use and I'll let you discover. The app is simple... somewhat nondescript, but still fairly easy to figure out. Overall... is this a band for you? It's comfortable, but I'm curious as to how long that band can last (luckily, you can purchase a lot of options online ... for fairly cheap as well). For about 1/3rd of the price of the 'name brand' competitor you get all the same features (Alta HR is $150 and has same Heart Rate monitor), but the interface is more 'rich' and easier to do. The thing it doesn't have is ... well, Fitibit. Folks I've chatted to really talk about the ability to taunt and challenge each other. I haven't seen with 'friends' on Mi Fit if you can do that. So, you have to balance the option of 'am I buying something so I can work on my fitness and have friends along that journey' or am I doing it for myself for a higher price or save some money. Personally, I don't care about the 'friends' (then again, look at my lack of weight loss ...😒). The saving is the biggest factor for me (my Scottish blood really coming out). Then, factor in that there's interactivity on the band and it's a no-brainer. Now the debate is ... do I just leave it or go back to Wear OS?